Hi! I know, I know, now that I'm retired you would think I'd have all the time in the world to update this blog and here I am posting less often! I'm not sitting around being idle, I swear! 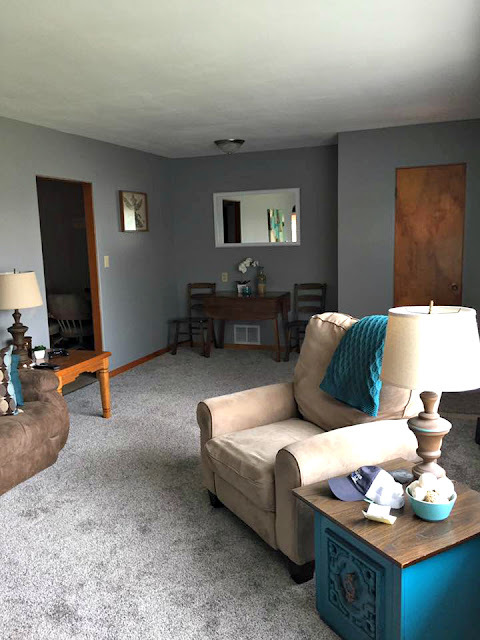 My son bought his first house last month and we've been busy updating there. If you're here for the micro macrame jewelry, you'll want to fast forward through this post, but here's what I've been up to. The house he bought was built in 1955 and is in beautiful condition overall, just dated and a little dreary. When you walked in the front door, the first thing right in front was this divider wall. Part of me hated to take it out just because it was in such good shape, but it really was right in your face first thing and just felt wrong. 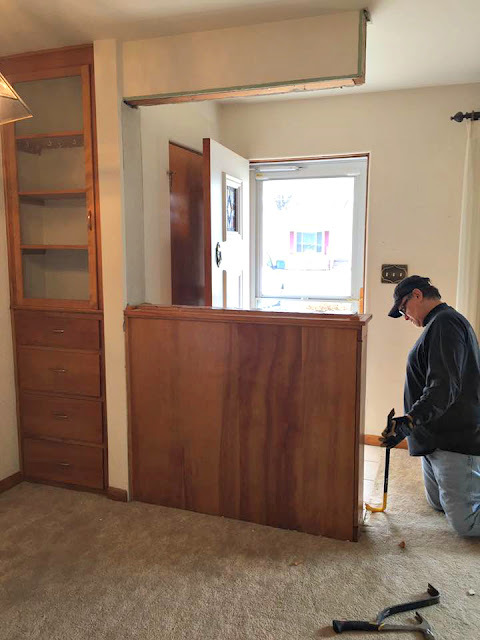 The first project was to get rid of it. Poor Mark (my husband) really had to work to get rid of it. The top header was actually tied into the rafters! Note the built-in next to it, though. 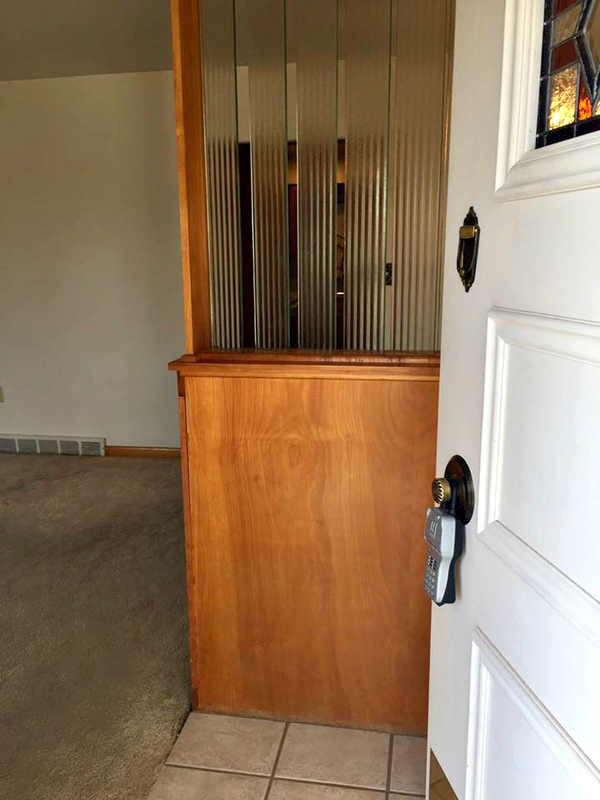 It (and several others throughout the house) is in perfect condition. See what I mean about dated and just kind of dreary? This is the rest of the living room before. 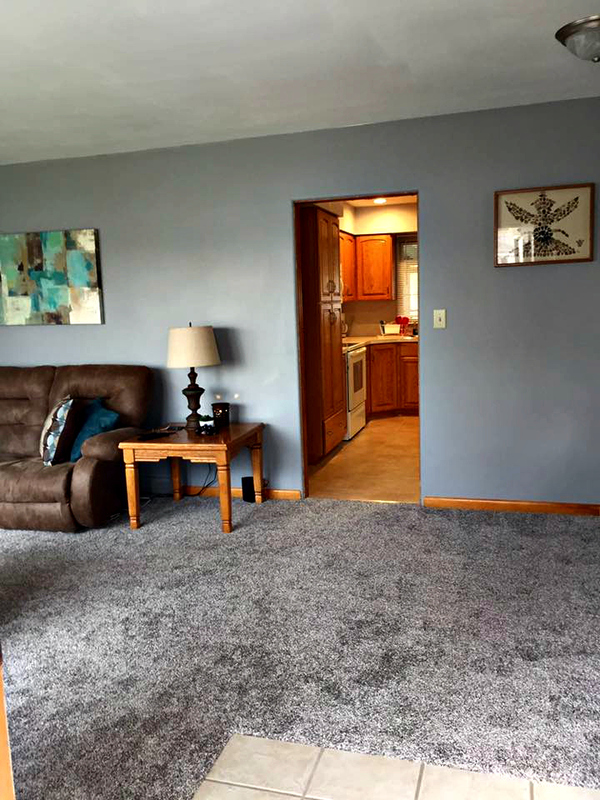 The carpet was really nice in its day, but that was a couple days ago. This is the view from the front door after. No wall in your face! 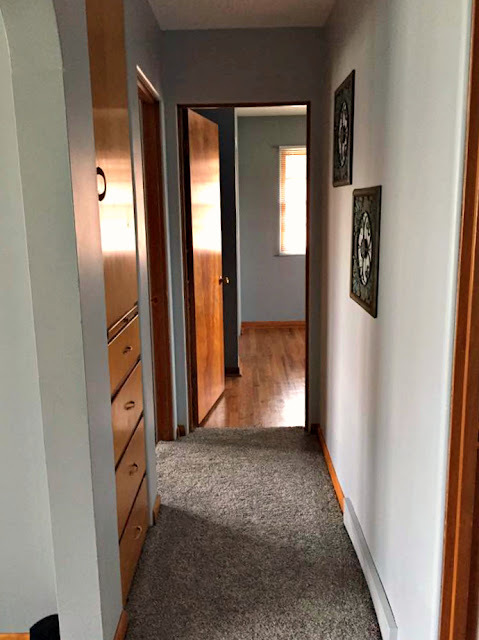 New carpet and new paint everywhere and it feels so nice now. He's making do with the furniture he had for the most part, but I think it works. The hallway before. We were going to take out the telephone nook just because it has no real use now, but in the end we kept it. 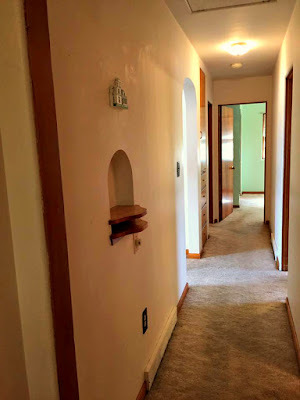 The hallway after new carpet and paint. The built-in is great storage and is in great shape. 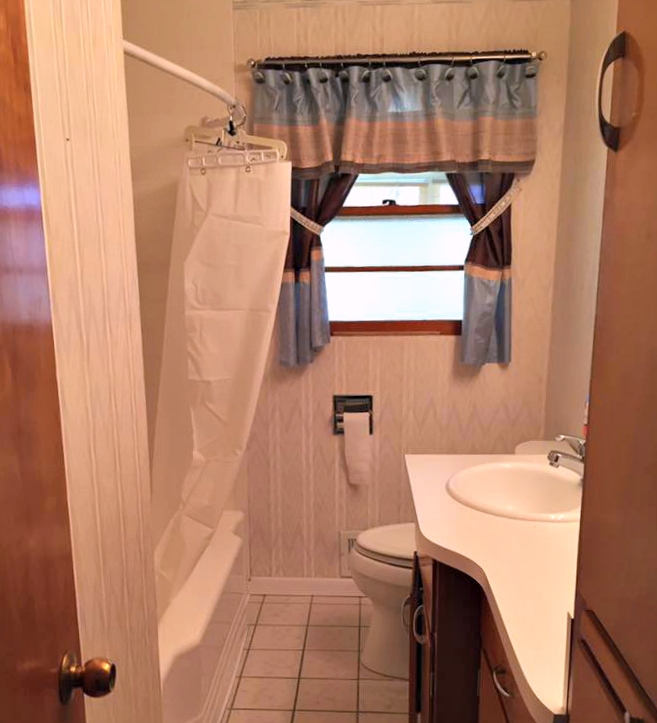 The bathroom is small but functional. It has a TON of built-in storage. We just did a little facelift on the space, removing the wallpaper and updating the window coverings. 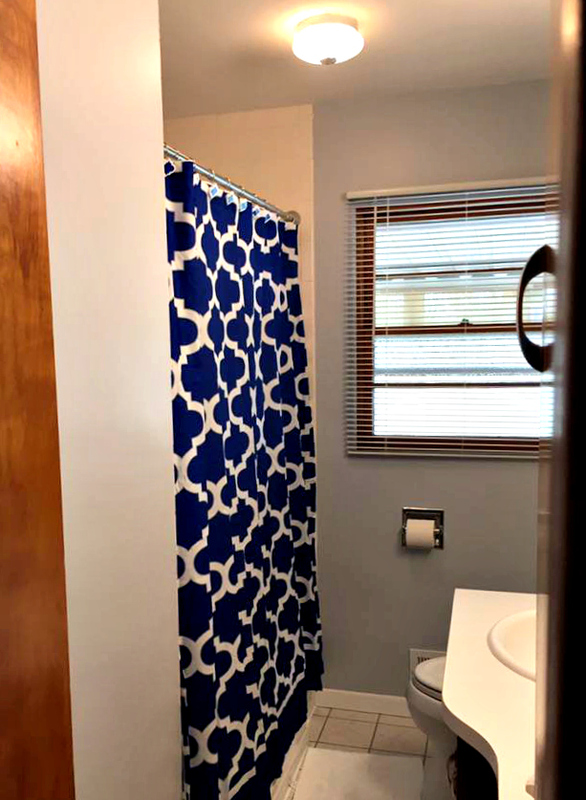 My son loves color, so we added a bright shower curtain for him. 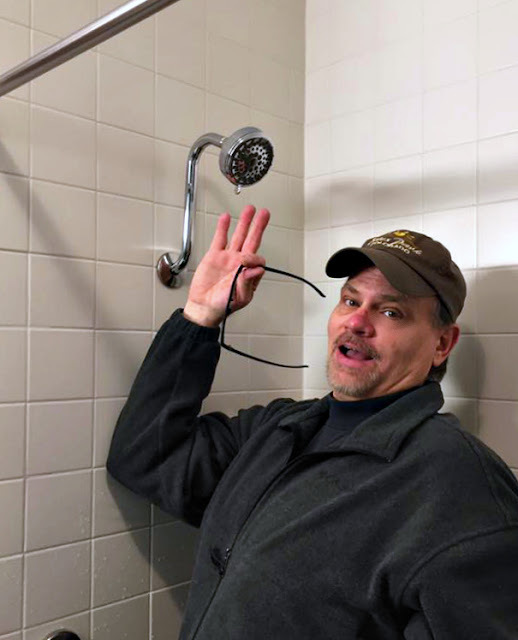 One of my son's favorite upgrades was raising the shower head a few inches so he can get under it to shower! I'm not sure why it was so low in the first place, but at least it was an easy fix. The master bedroom before had carpet and a wallpaper border. 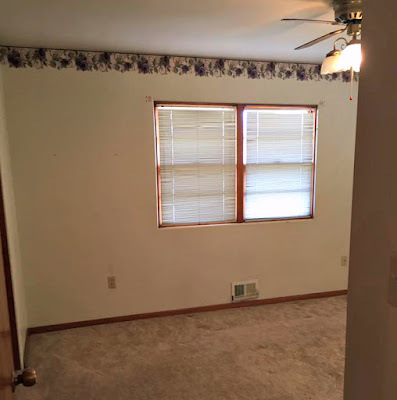 The ceiling fan was dated, too (who knew ceiling fans could be dated). It had stenciled gold and painted flowers on the blades and scalloped glass pieces. The blinds were saggy and sad. All easy fixes, though. 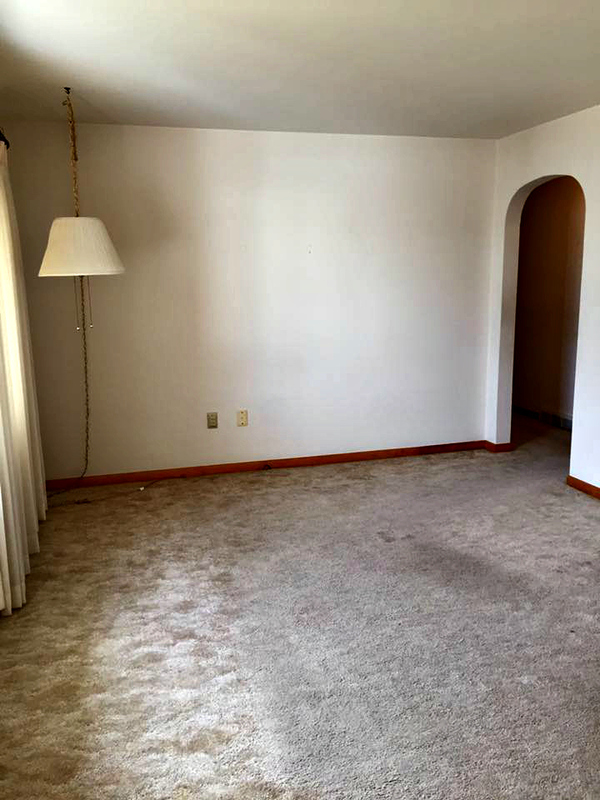 We were so lucky when we pulled up the carpet in all three bedrooms. 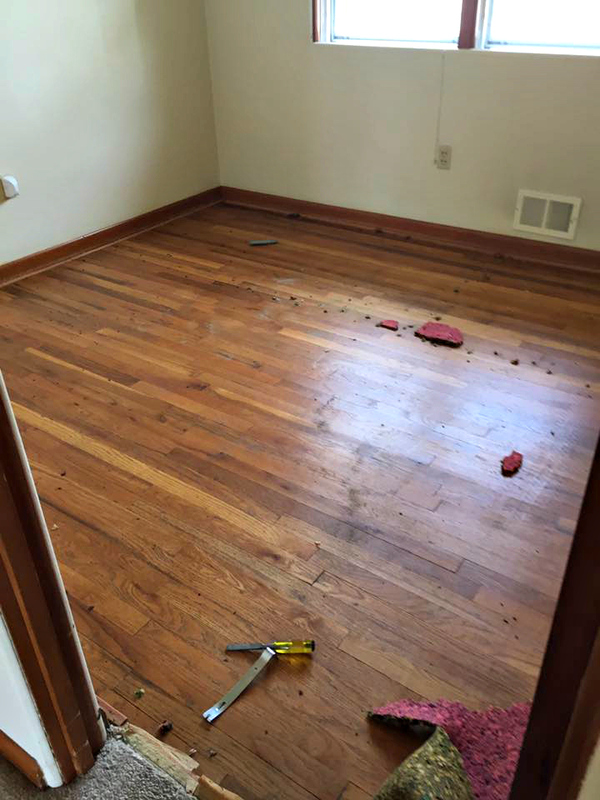 The original hardwood floors were in great shape. I pulled staples for two days and touched up the stain, but other than that, some restorer did the trick without having to sand the floors and completely refinish. Carter even got in on the work, helping Grandpa Stokey put in the quarter round around the wood floors. 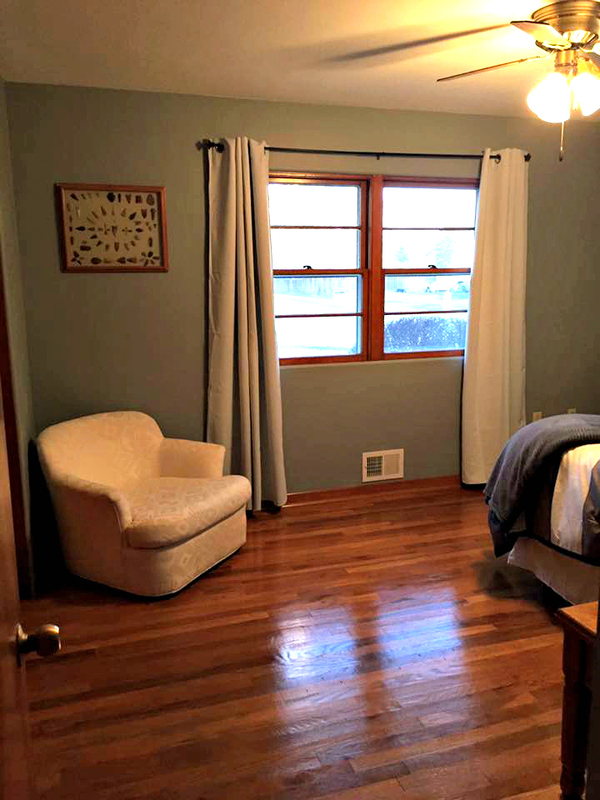 Can you believe how pretty that wood is? And to think it's been hidden under that carpet for years! You might be wondering what that first photo in this post was? 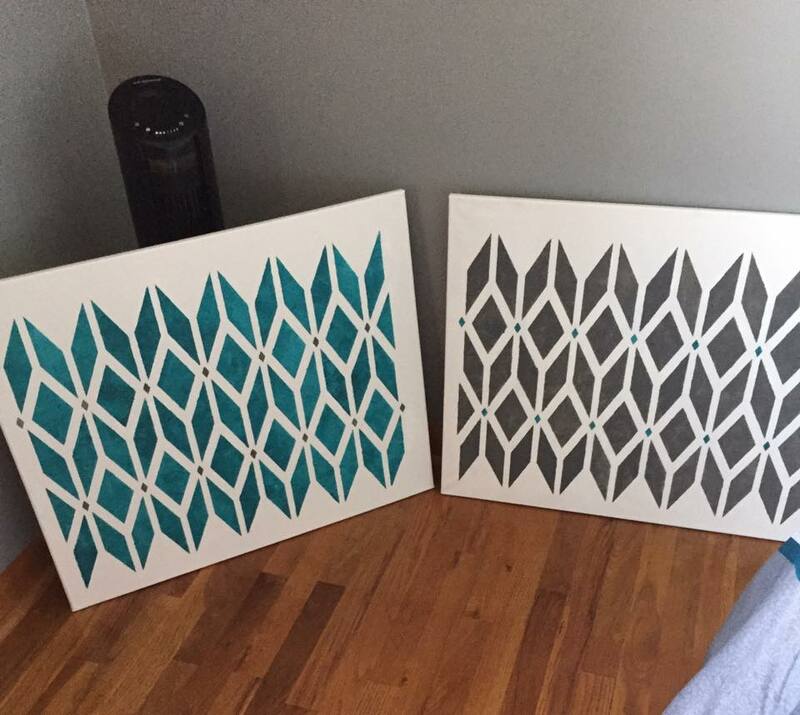 I did a couple canvas pieces for the master bedroom. 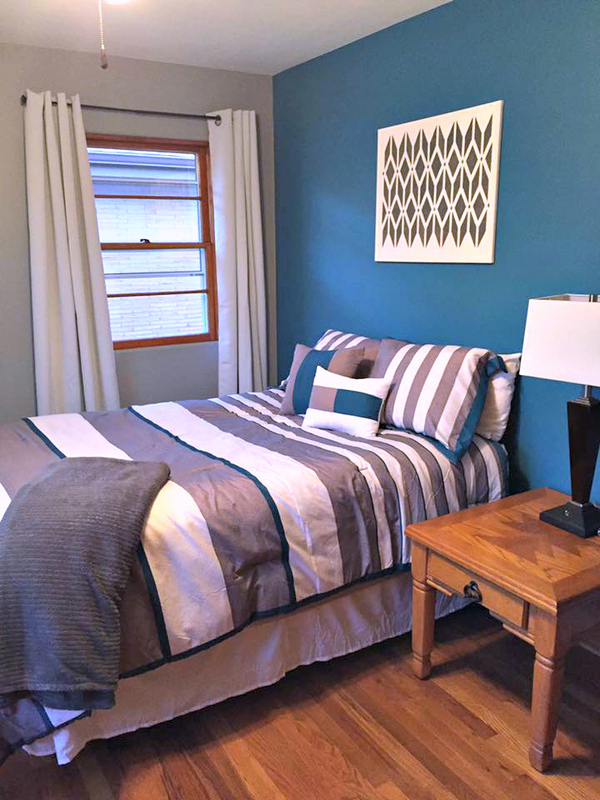 Nick picked a beautiful teal for that room which looks beautiful with the gray and white we've used throughout the house. 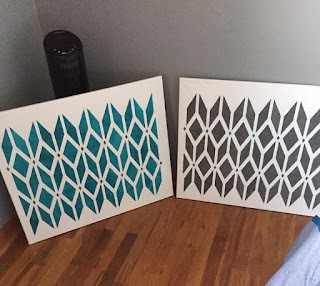 I stenciled a couple canvases in those colors that sort of bring the room together. 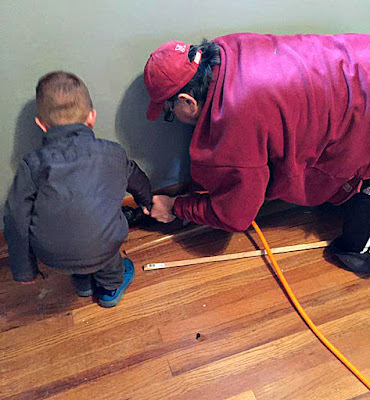 We haven't finished Carter's room yet because he wants bunk beds that will need to be purchased. 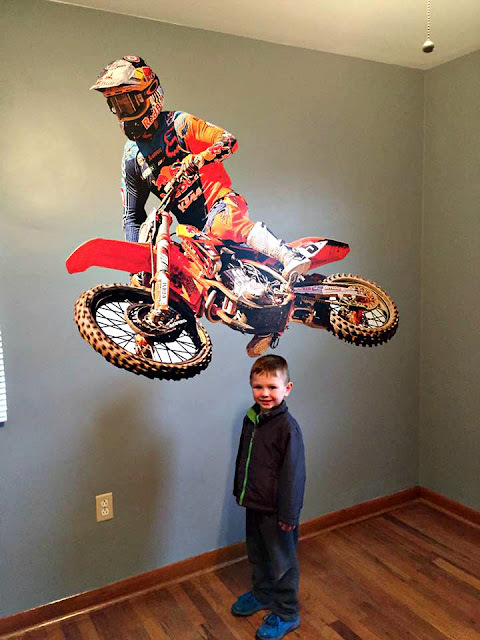 He's pretty happy already, though, with the big vinyl dirt bike on his wall!